This is a summary for Brinley now that she is 4.75 years old. Final countdown to 5! Sleep continues on as usual. She sleeps for about 12 hours at night and does rest time each day (really no napping). Eating is normal. She doesn’t usually eat a lot at each meal. She has the occasional meal where she eats a whole lot of food and you wonder where it is going to. Her emotions were higher toward the end of this month. An interesting thing about Brinley is she gets very emotional in the days preceding a sickness. She had some breakdowns where she just cried from a broken heart, then she woke up one day with a bad cold. Brinley started soccer this month and oh my how she loves it. Loves. She giggled through her entire first game. Her second game was in the pouring rain and she still loved it. She was sad one day when practice was cancelled because of the rain. She is in love. Brinley helped me plant the garden this year and she was actually helpful! Four year olds are not typically very helpful when planting, but she was. She has a high interest in gardening (even the foods she “doesn’t like to eat” HA!). 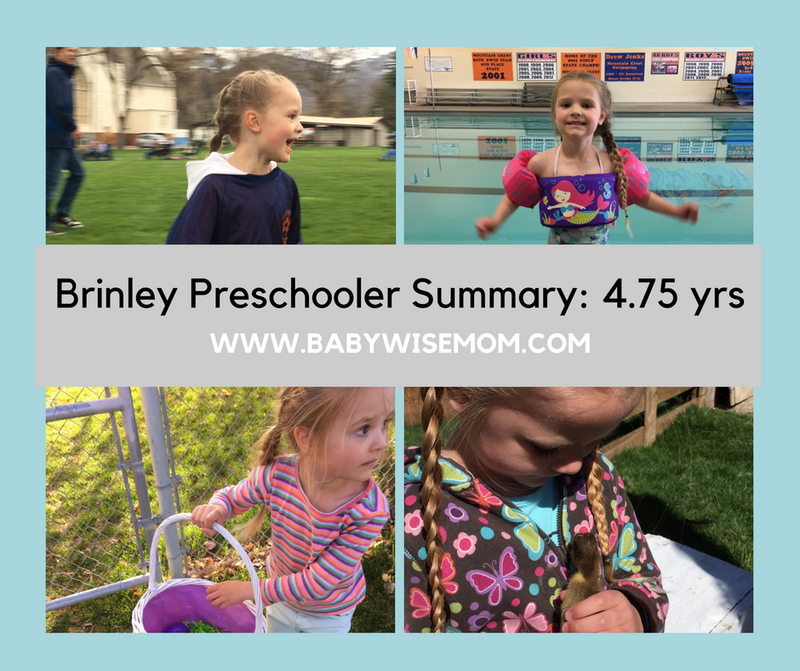 Brinley also does dance and has preschool 3 days a week. She also participates in a playgroup in the neighborhood once a week. Brinley is at a state of getting bored. She is very, very ready for the stimulation Kindergarten will bring. At the Kindergarten orientation meeting, they really stressed wanting the kids having good scissors skills. This sparked my memory that I had some Kumon workbooks to do with her. We have (affiliate links ahead) Kumon Let’s Fold! and Kumon Let’s Cut Paper! She loves them.